The Oregon Department of Energy and other state agencies are focused on various aspects of the Governor's Electric Vehicle Executive Order, which was signed last November. While state agencies are hard at work on our respective responsibilities, meeting the goals set out in the Executive Order – including a call to have 50,000 registered electric vehicles on Oregon roads by 2020 – will require strong collaboration between the public and private sectors. Stay tuned for frequent updates on how we can work together to move Oregon to a more sustainable transportation system. EV Rebate and EV Charge Ahead Rebate: The Oregon Department of Environmental Quality is implementing a new rebate program for the purchase of certain EVs, including battery electric and plug-in hybrid vehicles. The different rebates include options for new, leased, or used electric vehicles, with provisions to support EV adoption by low- or moderate-income families. Clean Fuels Program: Also overseen by DEQ, this program allows utilities to sign up for and get credits for EV charging that takes place in their service area. The DEQ programs site includes information specifically for electric utilities. VW Settlement Funds: ODOE staffer Rick Wallace is a good contact for utilities interested in applying for charging infrastructure through Electrify America, which was developed to implement requirements of the VW settlement funds. The state recently submitted a proposal for Phase II of this project, but there may be additional opportunities to work with Electrify America to develop charging infrastructure across the state. Coming soon: these programs – plus tools, resources, and information – will be available in one convenient location with the launch of a new EV-focused website. As we build the site out, we look forward to incorporating stories from your utility into the site. Exciting EV happenings in your area? Drop us a line with details! We had the dress rehearsal last month, but the real dance was earlier this week, when Oregon Department of Energy staff once again launched our agency operations center in Salem to respond to a simulated nuclear emergency at the Columbia Generating Station in Richland, Washington. These exercises are required by the Federal Emergency Management Agency and a critical component of the state's emergency preparedness training. Like last month, our AOC included representatives from the Oregon Health Authority and the Oregon Department of Agriculture, Oregon State University's Radiation Center, and the National Guard Civil Support Team. ODOE also had a team in Richland, while OHA and ODA had staff on the ground in Morrow and Umatilla counties taking samples of water, soil, and vegetation, just as they would in a real emergency. This month's exercise will be graded by FEMA reviewers, who were on-hand watching the teams practice working together, communicating with CGS officials and counties, and issuing advisories and information to Oregonians. Exercise participants also worked with Civil Air Patrol volunteers to fly samples to the lab at Oregon State University. In all, it was an exhausting but instructive day. Early feedback from the FEMA reviewers was positive, and we should know the full results of the graded exercise later this spring. In somewhat related news, earlier in the month, Ken Niles, who heads our nuclear safety and emergency preparedness division, spoke at an event in Richland, Washington, hosted by the National Academies of Sciences, Engineering, and Medicine. The event was all about Hanford and the long, complex road ahead to clean up the site. Ken's presentation touched on science, history, and the importance of a healthy Columbia River to Oregon. Read more about the event and ODOE's role. There's no Energy Facility Siting Council meeting scheduled in March, but Energy Facility Siting staff are staying plenty busy. All projects currently under consideration by the Council are listed on our website, but a few warrant extra attention as they move forward. Proposed Solar Developments in Lake County: Two large solar projects have been proposed in Lake County – one on the north end of the county, and one in the south. As part of the initial Notice of Intent phase, members of the ODOE siting team were in Silver Lake and Lakeview earlier this month for public information meetings. Staff plan to head back to the county after developers submit full applications, which include substantial amounts of field work data. These are the first state jurisdictional solar developments proposed for southern Oregon, and we expect to learn a lot as each project moves through the siting process. Boardman to Hemingway Transmission Line: This is both a federal and state jurisdictional project. We expect B2H to be in front of the Energy Facility Siting Council in April for a project update as the application nears completeness. ODOE staff will hold public information meetings shortly thereafter along the project route, then work to prepare a Draft Proposed Order, which is the initial recommendation on whether an application meets all applicable standards. Once a Draft Proposed Order is issued, it prompts a public comment period and a public hearing in front of the Council, where everyone is encouraged to offer input based on the applicable standards the Council will use to evaluate the project. Watch the project page for more information, or sign up for project update emails. Jordan Cove Energy Project: This is another large federal project, with state agencies responsible for multiple permits and processes. We've built a project page to offer a dashboard of key information so that Oregonians can easily find the latest milestones, information, and public comment periods. While these far-flung projects have kept the Siting team on the their toes, additional projects closer to home are also underway. Specifically, Todd Cornett, who heads up the energy facility siting division, has been participating in an ongoing work group formed by Senator Alan Olsen that's looking at various aspects of the energy facility review process. The group has met three times since November and will continue with monthly meetings this spring. ODOE presentations to the work group include a siting overview, an update on rulemaking, and an explanation of the types of energy facilities under state jurisdiction. 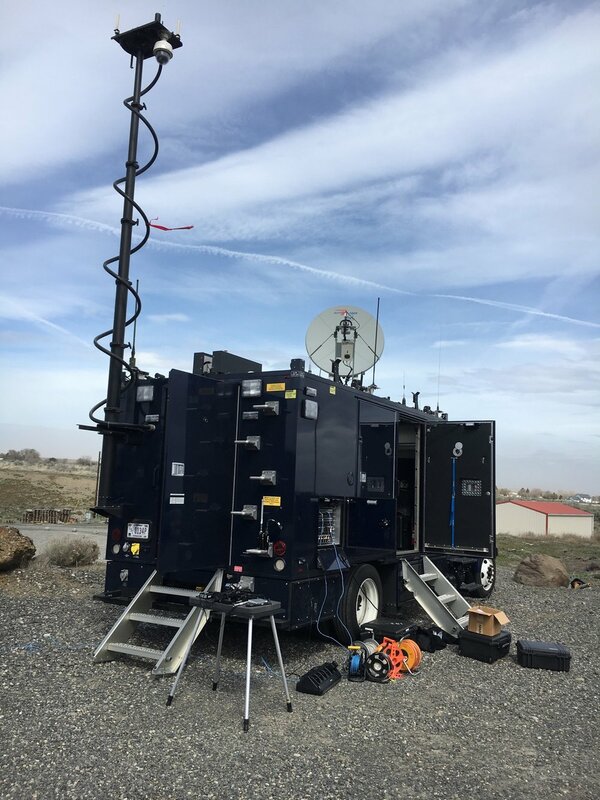 The Oregon National Guard's Civil Support Team brought out an impressive mobile communications unit for Tuesday's graded Columbia Generating Station nuclear emergency exercise. This unit was set up in Umatilla County, where state teams were in the field taking soil, water, and vegetation samples as part of the exercise. The Energy Facility Siting Council is recruiting for two volunteers to represent the Council on The Climate Trust Board of Directors. The Council's appointees also serve on the Oregon Offset Committee, which oversees the Trust's statutory obligations related to CO2 emissions mitigation. Full details and application instructions are on our blog. Speaking of CO2 emissions mitigation, ODOE is working with stakeholders on a potential update to agency rules. A Rulemaking Advisory Committee held a meeting on the state's carbon dioxide standards earlier in March, with plans to present information and recommendations to the Energy Facility Siting Council in late April. Catch up on the discussions on our rulemaking page. The Oregon Hanford Cleanup Board has an opening for a citizen member. Interested? Reach out to Ken Niles about this Governor-appointed position. ODOE podcaster Jenny Kalez was in Corvallis this month for a conversation with Jose Reyes, Ph.D., the co-founder and Chief Technology Officer of NuScale Power. Check out their discussion on Grounded, ODOE's podcast series. ICYMI: the Oregon Global Warming Commission launched a new website. We're hiring a Hanford Hydrogeologist. Please help spread the word! Position closes April 10. Our 2018 Legislative Session Report is available online. Find it here. COU managers should check their inboxes for information about April 12's ODOE/COU Managers Meeting and Resiliency Workshop. Both meetings will be hosted by the Eugene Water & Electric Board. RSVP or let us know if you have questions. As mentioned last month, the state of Oregon's kicked off its budget process for state agencies. The Oregon Department of Administrative Services is helping agencies like ODOE put together our draft Agency Request Budget for the 2019-21 biennium. Check out our budget page for a high-level overview of the state's budget process. We'll host public meetings for this summer to roll out our draft budget to stakeholders. Stay tuned for details!